Philly is back...get ready for sparks at another fiery Mid-Atlantic Regional. Disclosure: The author is a captain of RUNTIME ultimate, but will not be in attendance this weekend. It’s hard to imagine any team other than Washington D.C. Truck Stop taking the first bid from the Mid-Atlantic Men’s Region this weekend. That’s no earth-shattering prediction, no mind-bending scenario. But the Mid-Atlantic is a two-bid region in 2015, and the weekend will get very interesting as solid teams drop slowly into the back door bracket and battle towards the game-to-go. Philadelphia Patrol and Pittsburgh Temper have the pedigree to own those slots, and they’ll need to play each other for the right to see Truck in the final. Along the way, however, a bevy of regional contenders will look to knock the top Pennsylvanian contenders down a peg, seeking a moment of glory and a shot at maintaining or moving into the Select Flight. The first bid might be as good as gone, but the second bid is up for grabs. Being the favorite can mess with your head. Even with the best group at the tournament, an ill-managed mentality can sink a team that becomes too preoccupied with greatness. This is not Washington D.C. Truck Stop in 2015. “Nothing is guaranteed. The results for this weekend aren’t in yet, so we have to put them in,” said captain Jonathan Neeley. The team made some of the biggest waves with its 2015 offseason pickups as they looked to build on a strong finish last year. After struggling in the 2014 regular season, they collected themselves for Regionals, and narrowly missed greatness when they gave eventual champion Denver Johnny Bravo one of the best games of the weekend in a 12-14 quarterfinal loss at Nationals. Now, Truck returns to the Capitol Polo Club in Poolesville, MD, with a bigger, stronger, re-tooled offense and an experienced defense — a team deserving of the #1 seed in the region. Perhaps more notably, they enter the weekend with a clear mental focus, prepared to put in work no matter who stands between them and a bid. It’s about a commitment to a mindset: remove the need for a specific score, divorce oneself and the team from the pang of old rivalries, and trust that players will always be working as hard as they can in every moment. Neeley believes a strong point for Truck is their understanding that the team may be improving even when it hasn’t seemed apparent at points throughout the season. “…I think we’re pretty trusting that if we can focus in on the actions that we can take to achieve that goal of getting better all the time, even if it doesn’t feel like we’re reaching it in the short term, it really does yield some long term results,” he said. Though in-game they may focus intensely on the moment, Truck Stop will bring its best to roll right on home with their #1 seed intact, along with a bid to Nationals and the regional title. 2015 Mid-Atlantic Regionals pushes Philadelphia Patrol one tournament further into what they hope to be a brightening future for Men’s ultimate in the City of Brotherly Love. As they look to make a statement this weekend, they may also take themselves one more tournament away from a different past. For many following the Men’s division for longer than two years, Philadelphia was for sometime the territory belonging to Southpaw. Peak fitness defined that national contender, and their rep preceded them. Then, between 2012 and 2013, three different semi-professional teams flipped men’s ultimate in Philly on its head. 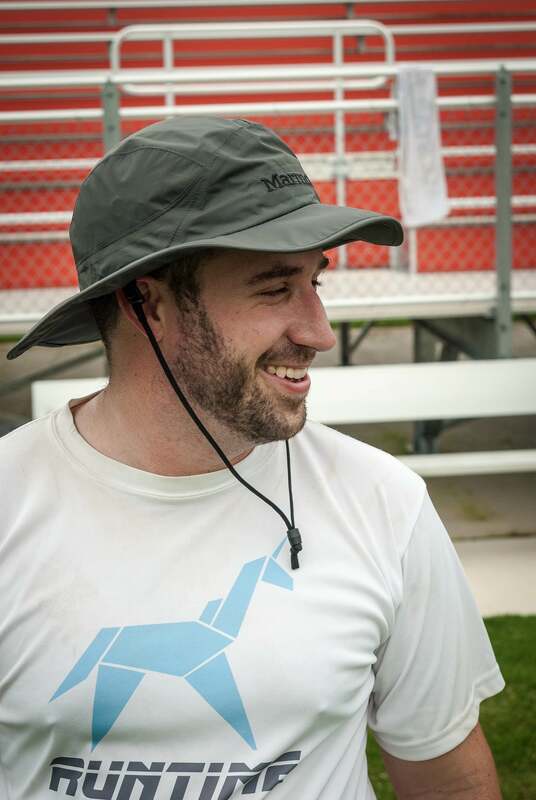 In 2012, Jeff Snader led the Philadelphia Spinners to the first-ever AUDL championship, then promptly took the team, left the league, and started the MLU. In 2013, the Spinners arose in the MLU alongside the AUDL’s new Philly franchise, the Phoenix. And Southpaw? It went on indefinite hiatus. Patrol emerged as Philly rebranded in 2014, but with the core of the men’s players that had been to Nationals splintered across different divisions. This year, leadership dug in for the long haul, players returned from the Mixed Division’s AMP, and results have been strong –steadily improving. “It’s been nice that we’ve been getting wins, but the big thing for us is that Philly ultimate is improving and on the up and up. We think it’s going to be a very sustainable thing,” said Patrol coach Charlie Hoppes earlier this week. Those results — mixed between the Elite, Select, and Classic flights — certainly look great. The team enters the weekend 22-4 in sanctioned play, having recently rolled through Founders Sectionals without much resistance at all.2 A strong, grinding defense has emerged, and it pairs well with an offense dedicated to high percentage passes and smart movement. There is little focus on a single playmaker. “Everyone’s a good player on Patrol…it’s a matter of getting those players into positions where they can be both dynamic and also high percentage. And then consistency happens,” Hoppes said, reflecting on the style of his team. The glut of experience of this team — from Southpaw, AMP, both semi-pro leagues, and beyond — has complimented their physical strength with patience and commitment, making them a difficult matchup for any opponent. The team is dedicated to improvement; their season goals are focused almost entirely on building Patrol back into a perennial Nationals contender, and that has made them positively dangerous so far this season. No team in the first or second round of play this weekend is one that has beaten Patrol, and it’s Pittsburgh Temper that will likely draw the 5 PM semifinal matchup. on Saturday. That may be the first question mark moment for Philly in some time this season, and they should succeed if they can keep their heads down and keep playing their own style of churning ultimate. Pittsburgh has the kinds of disc skills, offensive sets, and talented personnel to give Philly’s defense a real taste of the postseason–especially since Temper arrives in Maryland this weekend with a lot of ground to make up after some tough losses and an inconsistent regular season. Because of the format, the loser of that hypothetical semifinal could still play itself into the game-to-go on Sunday, a last-chance, all-out battle that will take place at 3 PM, right after the first place game. Neither team will want to fight through the back door to get there, though, which makes the last round on Saturday that much more dramatic. Patrol’s edge is their selflessness and belief in the greater goals. “If we don’t make Nationals, it will be extremely disappointing, of course, but we’ve already had such a successful season in terms of our stated goals…and building Philly to a place where we can be not only at Nationals year in and year out, but contenders at Nationals year in and year out,” Hoppes said. Oddly enough, if the team can keep their expectations under control and trust in the above instead of focusing heavily on outcomes or rivals, it may be that very notion of future greatness that pushes them through over the edge, and locks them into the second bid to nationals. Pittsburgh has been condensing its club talent now for two seasons. Temper emerged in 2014 when the current and legacy players from University of Pittsburgh’s En Sabah Nur joined others in a rebranding –instead of using the club season to hone the college team, they’d go after a club title, too. Results in 2014, much like Patrol in 2015, were great coming out of the Classic flight, earning the region another bid and allowing Temper to take the new team all the way to Nationals and the 2015 Elite flight. This season, the merging continued as Temper took on the best that local rival Dire Wolf had to offer. The team looked downright dangerous coming into the season, especially with the promise of extra reps as the AUDL’s Pittsburgh Thunderbirds. Something, however, hasn’t been clicking. Injuries and other roster inconsistencies checked Temper’s results early, and an unfortunate regular season finish at Bro Flight Finale may have left the team reeling from yet-to-be-realized high expectations that have gone so far unsatisfied. It’s a tough position to be in, especially when elite talent and experience have been woven into the team’s fabric since their start last year. Health and a near-full roster should be on Pittsburgh’s side (finally) this weekend, although their regular season finish saddles them with a difficult #3 seed and installs them on the same side of the bracket as Philadelphia Patrol. Temper could see a feisty Maryland Town Hall Stars in the second round, but the latter contender doesn’t quite have the strength to stand up to Pittsburgh at full strength. As mentioned earlier, Temper’s first test will likely be in the semis against a scorching Patrol team who may have the mental edge. If Pittsburgh falls into the 2nd place bracket, they’ll see many familiar faces from 2014 looking to make a statement and take them down. Floodwall, Medicine Men, Town Hall, and Garden State will all fight to stay alive; either of the first two teams could be the first opponent on Sunday for Temper at 11 AM. If seedings hold at the top end of the bracket, Temper may have their shot in the game to go: force Patrol to beat them twice in the same weekend. 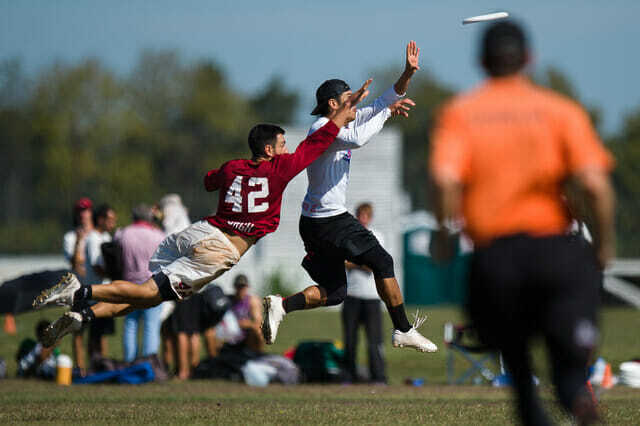 Ultimate in the Mid-Atlantic men’s region has been thriving in 2015. The Capital section featured an exciting, but brief shakeup in its first day of competition, with Town Hall Stars nearly beating Floodwall in one pool, while upstart RUNTIME surprised Medicine Men and John Doe with an undefeated run through pool play. Sunday saw the norm of more recent years return, as Medicine Men avenged their Saturday loss, fought their way to a second place finish, and Floodwall notched a decisive first place finish. #4 Floodwall and #5 Med Men will likely have to go through each other again on Saturday, with the unfortunate reward of seeing Truck Stop in the 1st place semis Saturday afternoon. No matter the results on Saturday, both of these teams will look for Select flight honors on Sunday, hoping to unseat Garden State who held that spot behind Patrol last year. #6 Town Hall Stars, #11 RUNTIME, and #12 John Doe will attempt to stay close by, trying to scrap into the top half of the Mid-Atlantic. From the Founders section, Garden State Ultimate, SOL, and Citywide Special will all be after the same spots. GSU lost a little firepower in 2015, and they remain vulnerable after trading games with SOL at Sectionals. Citywide, Patrol’s committed feeder team, have kept themselves in the Regional conservation nicely, with solid wins here and there throughout the season. Still, despite all having talent and good fundamentals, the Capital section sends three teams at #4, #5, and #6 to Poolesville, all much improved from last year. It’s unlikely that a bid would fall into the grasp of these teams — Truck Stop is head and shoulders above each team, while Patrol and Temper would need to falter fairly spectacularly to give a winning edge to these contenders. But the Mid-Atlantic remains strong and the drama will unfold in the back door bracket on Sunday, as each of these teams seeks to edge up towards the next flight in 2016, on the back of a team-defining win in 2015. Comments on "Classic Rivalries Renewed: 2015 Mid-Atlantic Men’s Regional Preview"